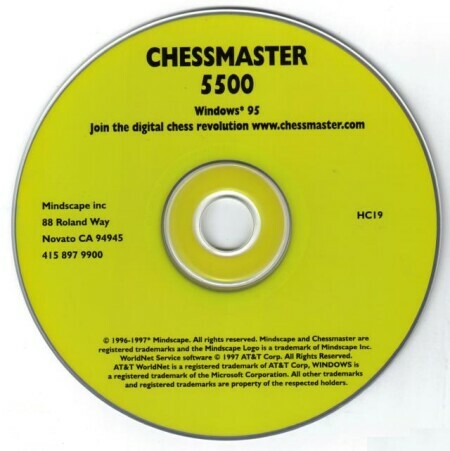 The worst thing you can say about Chessmaster 5500 is that you might not want to spend the bucks on it if you already own Chessmaster 5000 - but that's more of a comment on how outstanding the Chessmaster series is rather than a slam against the latest installment. 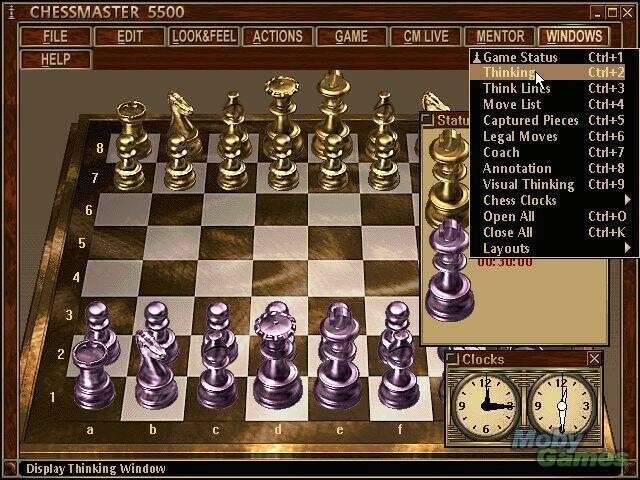 Simply put, Chessmaster 5500 is far and away the best all-around chess program for PCs on the market. There might be stronger chess engines available, but there's definitely none that has as much to offer novice, intermediate, and even expert players as CM 5500. Of the new features introduced in Chessmaster 5500, most notable is the addition of over 12 hours of audio instruction, critical analysis, and narration. Three of the program's 26 core chess tutorials are accompanied by speech, but don't think that's skimpy: All these core tutorials (including an excellent audio tutorial on chess concepts written by Grandmaster Yasser Seirawan) are subdivided into more specific categories. The addition of speech really does make the initially daunting task of learning strategies and ideas a much more appealing prospect, though I'd love to see the ability to "back up" during a lesson, as well as be able to actually move the pieces when challenged and be congratulated if you chose correctly. Another area where speech adds immeasurably to the presentation is in Josh Waitzkin's annotated games. Waitzkin, the subject of the excellent movie (and book) Searching for Bobby Fisher, is an international master whose love for chess shines clearly in his spoken analysis of five of his most memorable games. My favorite is his match against lifetime U.S. Master Ed Frumkin; it was the ten-year-old Waitzkin's first win over a master and was won by Waitzkin with a wonderfully planned sacrifice of the queen and a rook. (I particularly appreciated that four of the five games have separate annotations for beginners as well as advanced players, and that all feature the ghosted pieces and movement.) Waitzkin also authored eleven advanced chess tutorials, but these aren't accompanied by speech. But perhaps the most impressive use of audio comes in the game's Natural Language Advice feature. At any point during a game, you can ask the program to tell you what the best move is - and along with the suggestion comes an explanation of why it's best, complete with moving pieces indicating what moves you should make to your opponent's various responses. Chessmaster 5500 can also build a voice annotation (analysis) of an entire game, but how good the annotation is depends on the speed of your processor, the number of moves, and how long you allow the program to analyze each move. Even if it took an hour, though, the results would be worth it: This powerful and impressive learning tool was unmatched by any other chess game of its time. 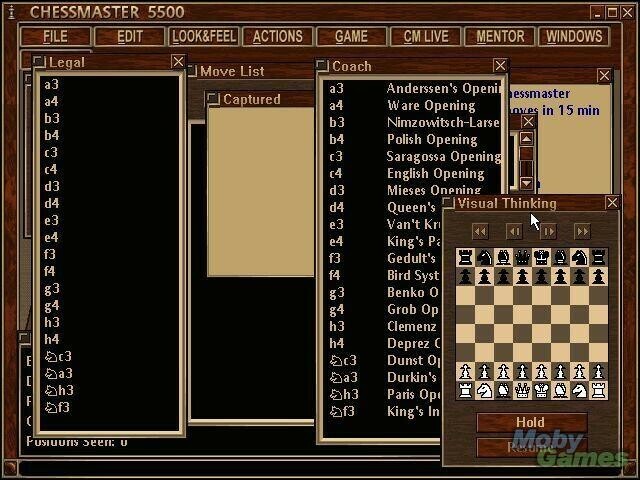 Just the tutorials and Natural Language Advice are probably worth the price of admission, but Chessmaster 5500 has several other interesting features for the beginning and intermediate player. With "Rate My Play," Chessmaster 5500 will approximate your level of chess expertise by asking you to make the correct moves at various points in historical matches; "John Nunn's Favorite Puzzles" provides 50 of the Grandmaster's favorite mind-bending chess puzzles that challenge you to find the shortest winning line for a particular position; and activating the teaching mode will inform you of hazards such as isolated pawns, pinned pieces, pieces that can be captured by your opponent, and more.